A programme that links postgraduate nursing students undertaking their final projects with health and social care providers is proving beneficial for both sides. Course leaders at Buckinghamshire New University, which launched its service improvement research and evaluation partnerships (SIREP) programme in 2012, say the scheme gives students valuable real-life experience of innovation and service improvement in a healthcare setting and enhances their employability. Meanwhile, host organisations, which include acute and community NHS trusts and voluntary organisations, say the students inject fresh thinking into their organisations and help improve services. For Robert Varro, the SIREP programme offered not only a hands-on research opportunity but was also the gateway to a new career. 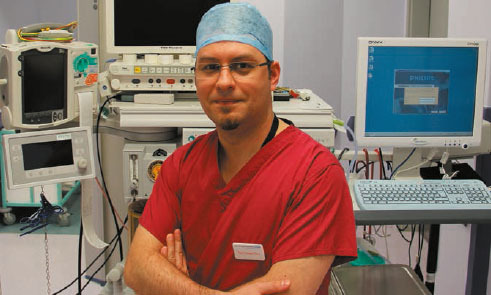 Mr Varro already held degrees in horticultural engineering and law and public administration and decided to train as a nurse after arriving in the UK from his native Romania. He was one of the first cohort of students on the two-year postgraduate diploma at Buckinghamshire New University and he was encouraged to link up with a healthcare provider to undertake his final project. He says: ‘During my practice placements, I identified a need for more research into hand hygiene in the theatre environment. Harefield Hospital gave me the opportunity to do some preparatory work, including developing my research skills and gaining a better understanding of infection control in the theatre environment. Mr Varro is now a theatre practitioner at the Royal Brompton & Harefield NHS Foundation Trust in London, where he is part of the theatre infection control team. Ruth Clemow, the university’s head of school for social sciences and education, says the SIREP programme benefits students by enabling them to take their learning out of the classroom. Ms Clemow, who was an NHS nurse and manager before moving into education, says: ‘I am always looking for creative ways of supporting students’ learning and making it “real”. The initiative, which was funded initially by the Higher Education Academy – ‘is about drawing together service providers and students with a common interest to evaluate and change practice’, she says. Ms Clemow says service providers, service users and students have the opportunity to meet each other during an initial engagement event. Helen Bodlak, lead nurse for education at Hillingdon Hospitals NHS Foundation Trust in west London says 16 postgraduate nursing students have undertaken preparatory research through the SIREP programme. Topics include helping to minimise the spread of norovirus, evaluating the benefits of single-room occupancy and improving the care of patients following stroke. She says: ‘Eight projects are still in progress and we have offered several students employment with the trust. Their work is an asset to us and an aid to the interview and selection process. ‘We will certainly be building on this initial research to improve service delivery in the future’.